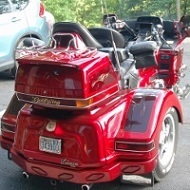 Just a note, ref batteries, I have the Odyssey PC 680 AGM in both my '97 G-1500SE trike and my '85 GL-1200Asp. I had no "cables rerouting" that needed doing, just a twist and maybe slightly longer SS bolt w spacer as I recall. I had my first PC680 last near 13 years in the trike, still use it as spare for whatever needed. It also fits my generator!